Robert Matthew Chudzinski (born May 12, 1968) is an American football coach who is the offensive coordinator of the Indianapolis Colts of the National Football League (NFL). He used to be the head coach of the Cleveland Browns. Chudzinski attended St. John's Jesuit High School in Toledo, Ohio. He played college football at the University of Miami from 1986–1990, and won a national championship with the Hurricanes in 1987 and again in 1989. He was a three-year starter at tight end for Miami. From 1994–2003, Chudzinski coached at his alma mater, the University of Miami. He spent his first two years as a graduate assistant. He then served as the tight ends coach from 1996-2000. From 2001-2003, he served as the tight ends coach and offensive coordinator. In 2001, the Hurricanes won the national championship. A year later, the Canes offense set school records for points, total yards and rushing touchdowns. During his tenure at the University of Miami he coached three All-American tight ends: Bubba Franks, Jeremy Shockey, and Kellen Winslow II. He has coached Winslow (Cleveland Browns) and Shockey (Carolina Panthers) in the National Football League. 2001: QB Ken Dorsey threw for 2,652 yards with 23 TD vs 9 INT. RB Clinton Portis ran for 1,200 yards with 10 TD. RB Frank Gore ran for 562 yards with 5 TD. WR Andre Johnson had 682 yards with 10 TD. TE Jeremy Shockey had 519 yards with 7 TD. 2002: QB Ken Dorsey threw for 3,369 yards with 28 TD vs 12 INT. RB Willis McGahee ran for 1,753 yards with 28 TD. WR Andre Johnson had 1,092 yards with 9 TD. TE Kellen Winslow Jr. had 726 yards with 8 TD. 2003: RB Jarrett Payton ran for 985 yards with 7 TD. RB Tyrone Moss ran for 511 yards with 5 TD. RB Frank Gore ran for 468 yards with 4 TD. WR Ryan Moore had 637 yards with 3 TD. TE Kellen Winslow Jr. had 605 yards with 1 TD. Chudzinski served as the tight ends coach and interim offensive coordinator of the Cleveland Browns in 2004. In 2005, Chudzinski was hired as the tight ends coach of the San Diego Chargers. With the Chargers, he coached All-Pro tight end Antonio Gates. 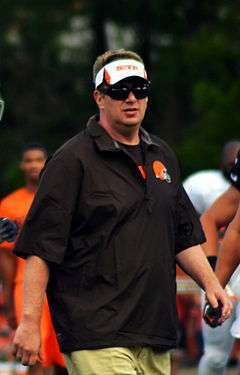 In 2007, Chudzinski was named the offensive coordinator of the Cleveland Browns. That year the Cleveland Browns ranked eighth overall on offense, sent 4 offensive players to the Pro Bowl, and finished second in the AFC North with a record of 10–6, their most wins since 1994. However, after the 2008 season Chudzinski was replaced by Brian Daboll as offensive coordinator, following the firing of Cleveland Browns head coach Romeo Crennel and the hiring of new head coach Eric Mangini. In 2009, Chudzinski returned to the San Diego Chargers as the tight ends coach and assistant head coach. In 2011, Chudzinski was named the Carolina Panthers offensive coordinator. He took one of the league's worst offenses in 2010 and transformed it into one of the top 10 offenses in 2011 with rookie quarterback Cam Newton. The Panthers finished seventh overall in the league on offense, fifth in points scored, and set a new franchise record for total yards in a season. On January 10, 2013, Chudzinski was hired as head coach of the Cleveland Browns. Chudzinski was fired at the end of the season after a 4–12 record. On February 8, 2014, the Indianapolis Colts announced that they had hired Chudzinski as special assistant to head coach Chuck Pagano. The two had previously worked on the same staff at the University of Miami from 1995 to 2000, and also with the Cleveland Browns in 2004. On January 27, 2015, the Colts announced that Chudzinski will serve as associate head coach under Pagano. On November 3, 2015, Chudzinski was named as the offensive coordinator, replacing Pep Hamilton. Born on May 12, 1968, to Gary and Ruth Chudzinski, he attended Toledo St. John’s High School. He lived in Bowling Green, OH from 1971 to 1972. He and his wife, Sheila, have three sons, Kaelan, Rian and Declan, and one daughter, Margaret. 1 2 "Rob Chudzinski stays with Colts". ESPN. Retrieved 27 January 2015. ↑ Sessler, Marc (December 29, 2013). "Rob Chudzinski fired by Cleveland Browns". National Football League. Retrieved December 29, 2013. ↑ Breech, John (November 3, 2015). "Colts fire OC Pep Hamilton; ex-Browns coach Rob Chudzinski to take over". cbssports.com. Retrieved November 4, 2015.